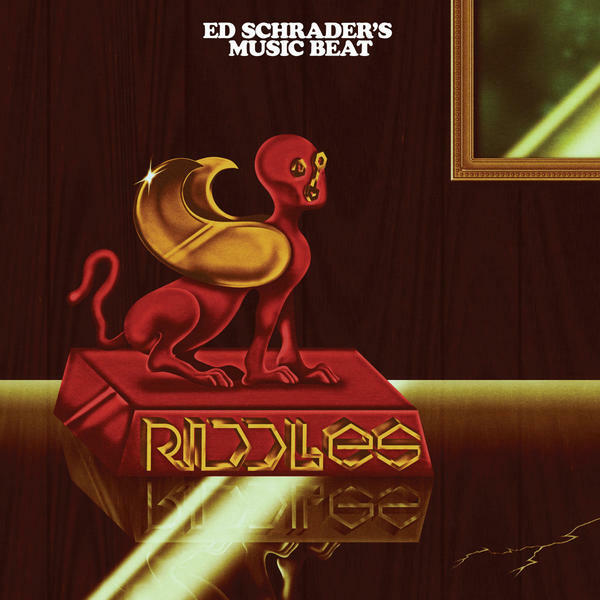 Riddles, the third album by Ed Schrader's Music Beat, is a fascinating piece of work that is both ugly and beautiful, often at the same time. The beauty of this music is in the trance-inducing pulse that drives it; a chaos of pulsing, incessant rhythms.The sound is reminiscent of two bands that captured my musical world around 1978 — the aggressively minimalist electronics-and-poetry duo Suicide and the dark, futuristic sounds of Pere Ubu's Dub Housing. To make matters even foggier, the duo that is Ed Schrader's Music Beat is, at least for this record, a trio, with their friend (and ours) Dan Deacon, as producer, recording engineer and co-writer. Simply stated, Ed Schrader is the lyricist and singer and Devlin Rice the bass player. But, of course, it's more complicated than that. To provide some clarity and shed some light on their shadows, Ed, Devlin and Dan were kind enough to walk us through their creative process, introduce us to their muse, explain their motivations and explore the happy accidents that gave birth to this odd and captivating piece of work. Ed Schrader: With "Dunce," I was really trying to capture the essence of Arthur Seaton, the main character of "Saturday Night and Sunday Morning" — a great piece of kitchen sink fiction I recently read where our man, Arthur, is constantly at odds with his vices, brought on by post-trauma and repressed rage at having to comply with factory life. He becomes numb and lashes out on the weekends in an alcohol-soaked spending spree, which always finds him in a damp laundry pile of regret Monday morning. I feel like we all get sucked in that quicksand one way or another — but it's also about being tough and savvy even when someone is belittling you. Keep your eye on the prize! Dan Deacon: Despite all of us being close friends for years, this song, being the first we dove into, was a way for each of us to learn our methods and approaches in this new dynamic as co-writers and collaborators. I really love Ed as a lyricist and the mantras he creates fascinate me. I wanted to make sure we utilized his lyrical style in shaping the song form as much as possible. When the band came to me, they had a collection of demos in their former stripped-down style, most of them around 90 seconds long. The guys had stated before we started how song form and development were something they wanted to experiment with. With that in mind, Ed's lyrics became the focus of the form and development. For example, the looping vocal phrase that enters at 0:18 that runs throughout became the ostinato grounding that everything else built off [of], and the synth lead line that comes in around 2:06 is actually Ed's processed voice. Using his voice in this way acted as a way to expand the sound, and allowed us to experiment with expanding the sound, while working with the original elements of the minimal band. Of course, that brings us to the bass guitar and its massive role in all this. Growing up, I really loved bass guitar-centric bands, like Morphine and the Violent Femmes, so I was especially excited to work with Devlin, who had developed a very amazing minimalist/maximalist approach in his writing. He really knows how to fill out an entire song with just his bass in a way that has always impressed me; leaving so much room for Ed's vocals, but filling in every other space without being busy or showy. Ed Schrader: For me, this song is a mid-life crisis in stereo. It's about vacillating between acting like an eighteen year old for eternity, or "joining the human race," as Steely Dan puts it in "Kid Charlemagne." Though, unlike Steely Dan's main character, my character's not running from the law after hocking designer drugs for years — he's a burnt-out DJ who's been haunting the same clubs for years and can't find it in himself to tell the person he's in love with their true feelings. He's successful enough to hang around, but will never see his name on a poster. Devlin Rice: Despite what Ed might say about this, I think it has to do with — at least in title — the time we ate a seagull in Prague. We wanted to have a truly traditional Czech food experience and asked our Czech tour manager for his recommendation. Tomas took us to a real nice restaurant and picked our meals out. Tomas had larded beef, I was chosen to have pig knee, and Ed was to have "the bird." The pork came out on its own roasting tray, as well as "the bird," with all sorts of wonderful horseradish and pickles, etc. We are both thoroughly enjoying some of the best food we have ever eaten when Ed asks what is the name of "the bird." Upon the revelation [that it was seagull], Ed — who at the time was really enjoying it — threw down his utensils, hands in the air, announces "I'm done!" I ended up finishing it for him. Gulls have a lot of dark meat and are very tasty. Ed Schrader: This one is biographical, I suppose. "Riddles" has a sense of urgency and romance that can only come in rich, deep moments that strike your core and etch themselves into your essence. Like a Harry Potter scar! It manically jumps between me being a teenager and hiding out in my weird basement room, smoking my stepdad's cigs, listening to The Cranberries, taking myself way too serious, [and] fast-forwards to a more present self, swept up in the existential crisis of losing my dad, stepdad, and David Bowie — also my dad — within like, two years time. I could not hide in my head and bury myself in irony and Frasier, try as I did. I was left awake and vulnerable, which I kind of needed at that point. I was running from facing myself. I was putting off an intense surgery and smoking too many cigs and hiding in moments. "Riddles" did me a little favor. It was time to face the cold wind of now. So glad I did. Devlin Rice: We had been working on another song we had brought in (and ended up ditching) and hit a wall. Dan took off for an hour and left us in the studio. I came up with the piano part by playing with an arpeggiator with some delay, then wrote the riff for the chorus as well as the lead organ line. The melodies that I wrote are a reflection of what I was feeling at the time, dealing with the recent loss of my brother. The way that the organ line feels like it's breathing and sighing is a nod to my brother's struggles [with] breathing in general. Ed was immediately struck, penned the vocal melody and began writing the song on the spot. Dan came back in while we were jamming with a look of complete shock on his face and said: "What did you do?!" It felt very special, and there were jokes about how Bono is going to have to move aside. We make a lot of U2 jokes. Dan Deacon: The band had been on a long hiatus when we first started. Living in separate cities, it had been several months since they had seen each other. Devlin was only able to come down to Baltimore from Providence on short breaks from his job, so our time together was very scarce. But despite that scarcity, I needed to make sure they had a chance to re-bond as a band. One night, when things seemed stuck, I set up a loop for them to jam over and a hooked-up synth set to a piano patch with timed effects and note filters to match the key of what we had been working on. I then left with the recording rolling, not really explaining how to stop it or start it over, hoping the time alone would be good to experiment and reconnect. It was great coming back and seeing them so excited about the foundations of this new song. What they had made was awesome. It was a real turning point in the process. Ed Schrader: "Dizzy Devil" is all about the clogged arteries of communication that will lead to this country's inevitable heart attack, unless we really make an effort to leave Facebook behind, connect in real life, and stop washing down rumors with a vitriol chaser! I have family members who can't even look each other in the eye and it deeply saddens me. I had Peter Gabriel [his third album] in heavy rotation at my place while writing this jam, and I feel like that album's sense of class tension, neurosis, and Big Brother seeped into the DNA of "Dizzy Devil." It's about feeling like you're in a state of constant surveillance, where the undiscerning eye of the internet is judge, jury, and executioner. Devlin Rice: I think there was still a feeling that we wanted to represent some of the agitated energy that our live show brings, even though we were seeing that our sounds was expanding in other directions rapidly. What ended up happening was a more cinematic expression of those live elements. I am so thankful for the amazing performances of Jeremy Hyman on drums, Andrew Bernstein on sax, and Owen Gardner on cello. Dan Deacon: At the same time I was working on this album with Ed and Devlin, I was composing and recording the Rat Film score, and had sessions booked with [saxophonist] Andrew "Bernie" Bernstein and [cellist] Owen Gardner. In those sessions, at the end of recording them for Rat Film parts, I would play them loops from Music Beat songs and try out some simple parts, structured improvisations, and other ideas. Once I had those sessions tracked, I sifted through the recordings, chopped them up and layered them into new parts. Additionally, as soon as I heard the initial demo by Ed and Devlin, I knew I wanted Jeremy Hyman on the drums. I immediately composed several parts with him in mind, and couldn't be happier with his playing. Bernie, Owen, and Jeremy made working on this piece so much fun. They are all such huge players and brought so much to this album. 5. "Wave To The Water"
Ed Schrader: [The lyric] "wave to the water" is a reference to an Elton John song that I love called "Healing Hands." He actually says "ya gotta wade into the water — ya gotta learn to live again," but I always thought he said "wave to the water." I find that often times the thing I think they mean is way cooler than what they're saying. Like in The Police's "When The World is Running Down You Make The Best of What's Still Around," Sting says "make records on my own — can't go out in the rain." I always thought he was saying "make pickles on my own — can't go out in the rain." Eventually, my cousin, Craig, explained it was not so — [but] it made sense to me and I do know how to make pickles now! Devlin Rice: Dan wanted to have two sorts of interlude solo pieces on the record. We have, historically, always had a number that was a capella — "Weekend Train" and "Airshow" on our previous records. The original title was "Roger Rabbit," [but it] probably would have been harder to take seriously if that was the title. Dan Deacon: At a Music Beat show, some of my favorite parts of seeing the band are when Ed sings between songs. Often these are hilarious jokes in a sing-song fashion, and other times they are amazing, out of the blue a capella covers of Sinatra or The Police song "Tea in the Sahara." The album needed a few moments to breath and reset the tone, so Ed and I set out to compose a piece with those live interludes in mind as the influence. We first started with a looped phrase of that Police song, where I asked Ed to sing different lyrics and melodies over it. Then I would change the chords to match what Ed was singing, and Ed would change slightly. After countless iterations of this process, we had completely eroded the entire Police song away and were left with a new thing entirely. It was one of my favorite processes as a co-writer on the album. Ed Schrader: "Rust" is just saying what Kathleen Hanna already said: "Get off the internet!" The real stuff is happening in the bars, basements and music halls. "Gimme rust" is me saying: "Let it rust! Get back to what's real man!" "Rust" is also an homage to Chain and The Gang's song "Certain Kinds of Trash." We toured with them, and Ian definitely woke me up to my inner angst in a real groovy way. Devlin Rice: We have expanded our sound, but still have a face melter to bring into the mix. Ed shouts out to our good friends, The Pilot Light, in Knoxville, and the band Daddy Don't. Ed Schrader: I wrote "Kid Radium" around the time I saw a play about the Radium Girls, women who were exposed to radium in the workplace and as a result suffered immeasurably. "Kid Radium" is, germane to the song, a metaphor in a sense for kids in Baltimore exposed to literal toxins — lead paint and a toxic antiquated system that chooses prisons over rec centers. I mention a "haunted stadium" in the song as a reference to the Freddie Grey protests, which happened to be right outside a vacant Camden Yards, where the Orioles played to no one for what I believe was the first time in the history of Major League Baseball. In my mind, it conjured the thought of the ghosts of all those victimized by a corrupt system. Devlin Rice: There was a lot of push-and-pull with this one. Ed wanted it to be one way, a little more lo-fi, Guided By Voices/R.E.M.-ish, while Dan had other thoughts about it. The drum beat is interesting, since that seemed to be one of the sticking points. Dan recorded Ed playing the song on the old red drum, then took that audio and exported it to a full kit using MIDI. We needed Ed's style to be translated onto the drums to get the right feel. From there, it was easier to build the melodic elements. This songs also made us fall in love with the Mellotron, which gave us that soaring line in the chorus. Ed Schrader: Watching Dev make this was like watching someone make a three-layered cake for the first time, perfectly. I literally got up to grab a coffee and check my voicemail, and when I walked back in I was stunned to see that thing he was noodling with twenty minutes earlier had became a perfect little gem that I am so happy to have on the album. It's our "New Orleans Instrumental." Devlin Rice: This was a tune that I had for a few years. We tried to work it out with vocals, but it was pretty clear it should just stand on its own. The title was just a working title that stuck. I really like how it transitions to the last two songs of the record, like when the Enterprise comes out of a wormhole and a new world is discovered. Dan Deacon: I really wanted there to be a section of this album that was just Devlin, and I knew he had some parts up his sleeve that hadn't been turned into Music Beat songs yet. I loved these riffs the moment he shared them with me. My mind immediately went to night driving in the desert, alone with your thoughts. Anyone who has ever toured for a serious amount of time knows that mindset vividly. It's a bittersweet sensation out there, in the vast loneliness. I wanted to make sure these beautiful parts were treated with that same sense of vastness and tried my best to contribute to the longing the melodies brought forth. Ed Schrader: "Tom" is kind of a mish-mash of "Major Tom" stuff mixed with personal history about my stepdad, Tom. He actually liked that song,"Space Oddity." The only Bowie thing I can remember him getting into. I remember hearing it on one of his many mix tapes. He would make these wild mix tapes that would have everything on them and I mean everything. One second it was the soundtrack to Camelot, the next an interview with Babe Ruth, then Bob Seger's "Roll Me Away," followed by Johnny Horton, then Patton's entire freaking D-Day speech. It was one of the things I loved about him. But this is also about Bowie. [The lyric] "are you gonna celebrate that day in ash" is a nod to "Ashes to Ashes," and also "Word On A Wing," where Bowie manically serenades the heavens from the depths of a cocaine blizzard while huddled up in L.A. on "Station to Station," but in that same line I say "wipe the black under eyes just like his face." That's all Tom. He played baseball in his younger days. Baseball and those mixtapes were something we both loved. We bonded over baseball. We'd go to see our beloved Giants whenever they came to Montreal, which was not far from Utica. He'd stop at a random wooded spot and we'd make baloney sandwiches on the hood of the truck. It was a blast. I loved that part of him. That's also in "Tom," I guess. Devlin Rice: This is the first song out of all of them that we wrote in the studio, and the first that had a bass line that didn't follow Ed's vocals. Our old method was to write to Ed's ditties and go from there, so "Tom" stands out in that respect. Dan and Ed worked on this one quite a bit while I was in Rhode Island at the time. I was struck dumb with each revision that they would send. Dan Deacon: When Ed first presented these lyrics, it was really intense and very emotional. Using Ed's words as the lone framework, the song grew out from experiments in form over various chord progressions on piano. Ed would experiment with vocal melodies and styles while editing. Once the song structure was there, everything else started to fall into place. At this point in the whole album process, we were in pretty deep and it was really fun to experiment with a very different orchestration from the rest of the album. I wanted to make sure the orchestration changed and evolved as the song progressed in harmony with the development of the lyrics. The first time we hear "I remember Tom," it has a much different tone than the last, and I wanted to make sure arrangement matched the emotional development Ed laid out in the lyrics. Ed Schrader: "Culebra" is a beautiful island in Puerto Rico which my partner and I somehow scrounged up enough money to get to a few years ago. I was about to set off on my second world tour to support Party Jail and we wanted to squeeze in some "us time." We visited sites throughout Puerto Rico, and you could not help but notice the constant tension between paradise and the remnants of industrial tyranny hinted in the shells of old sugar plantations that fueled America's sweet tooth for years. As well as the gaping hole of disparity between wealth and poverty. That said, everyone we met walked with dignity and a peaceful heart, at no point did I feel unwelcome. We traveled all over, from San Juan to the rainforests to Maricao, where we were thankfully the only tourists at an amazing festival of independent coffee farmers. [Ed. note: As we've learned...] I love coffee! I was devastated and embarrassed to see how shabbily our friends were treated after the hurricane. Oddly enough, I wrote it before the hurricane, which is eerie because I say: "Don't wanna wake the gods from a slumber deep." This was referencing a giant statue covered in ivy at the foot of a great hill I saw in the rainforest. It looked as though it were a sleeping greek god. Dan Deacon: It's important to note that Ed composes his lyrics on hundreds of scraps of paper. Napkins, cardboard, flyers torn off the wall. After that, he would record these ideas sung into his phone almost always, quietly in hushed whispers, in secret, while in a public place like Barnes and Noble or Dunkin' Donuts. This process has always fascinated me. Ed came to the studio with these lyrics recorded in that fashion. This was towards the end of our writing process so all of us were very open to new approaches and directions. I feel like we had all really hit our stride as writing partners, and the band was very open to experimenting with different styles and arrangements. Like most of the album, we let the lyrics guide the process.